It’s designed with a flat bottom too, so it doesn’t always need to be carried around — it can stand on its own like an independent little tot, on a desk or countertop or whatever. 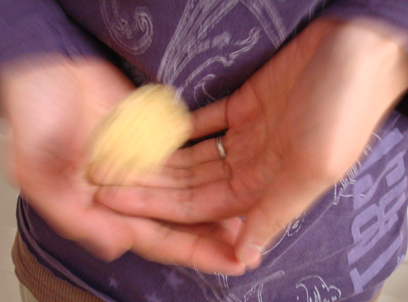 If you, too, would like to make a tot to carry around in your pocket, here’s what I did. Edit 08/29/11: Row 1 is to achieve an oval base by working sc’s into both sides of the beginning ch. Apologies for not being very clear before, I added new process photos after a few inquiries specifically regarding this step, hope it helps! Row 1: ch 5, 3 sc in 2nd ch from hook, 1 sc in each of next [2 ch], 3 sc in next ch, 1 sc in the remaining loop of each of the next 2 ch (the underside of the same [2 ch], indicated by the arrows in the picture below). Complete row with sl st in the first sc of round. Sew on eyes and mouth. Stuff with stuffing. Row 6: ch 1, 2 sc tog 5 times, sl st in beginning sc, leaving a 6″ tail, tie off. Weave tail around each sc in the opening, pull tight and tie off. Weave in end. Circle time with Mrs. Clip (who also works part‐time as a chip clip around here). So what else can we do with the tots, except carrying them around in our pockets? And when you’re busy with other things, they can hang out on the fridge (on the frozen section, of course). 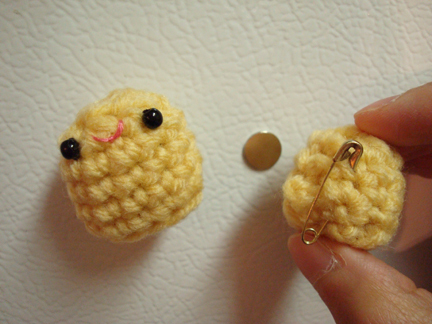 Just put a safety pin on it and stick it on a magnet. And they never go stale! 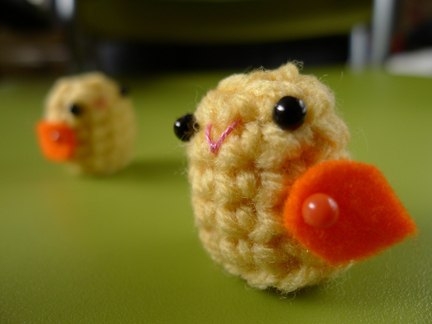 So in a month’s time just add some wings and they can double as chicks for an Easter display. What am I going to do with all the tots? Well, I’m afraid I have more plush than I have room for them. 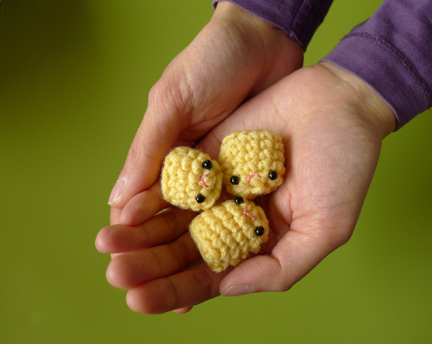 So if you like the tots but don’t know how to crochet or don’t have time to crochet, I’ve put three in the shop, they’d love for you to visit! And I would like to thank Mike for spending the whole afternoon helping me with the photoshoot and putting up with my silly determination to take the perfect tossing pictures. Love you! And I’d like to thank you for dropping by! I realize that many of us don’t have the luxury of March Break but I hope you enjoyed taking a break and visiting with the tater tots here! Oh my gosh, I loved this post! Too funny! Yes, you do have a very nice husband :-). 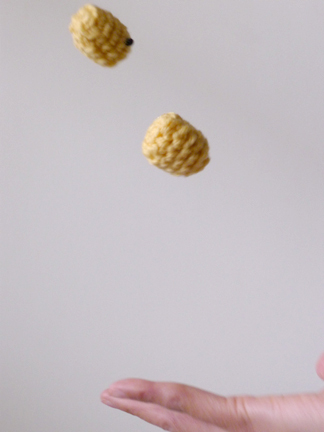 It was quite the thrill when my brother and I got tater tots as kids; love them! thank you, Nancy! i had lots of fun with the making of the post too! I love it!! Sooo cute… Thank you for sharing!! glad you like it, Sherry! ok, well I have a bit of an itty bitty problem with the 6th row… I don’t really understand it. :/ is there anyway that you can show a phototutorial or something? Anyway, about row 6, it’s basically single crochet (sc) 2 stitches together, and repeat that until there’re no stitches left. According to the pattern you would have 10 stitches in row 5, and so you would end up with 5 sc at the end of row 6. After that just slip stitch into the first sc of the round (it would be a 2sc together stitch), like all the previous rows. Just in case you’re interested, here’s a video demonstrating the 2 sc together maneuver. Hope that helps! If not, feel free to contact me and we’ll work this out! this step is a decrease round. 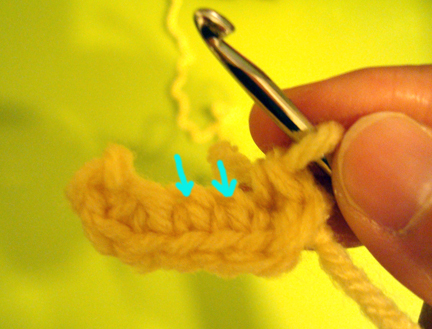 you gonna combine 2 stitches into 1. first stitch, you don’t finish the sc, but leave the 2 loops on your hook, and sc the 2nd stitch, finishing the stitch off, there, as you would for a normal sc. you continue to do this all the way around. :) hope this helps you. I love the tater tots. They are adorable. These are awesome, haha. 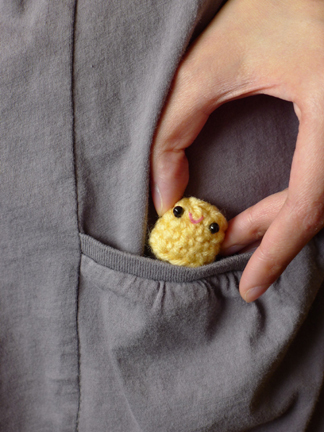 But is this amigurumi or just regularly crocheted? Sorry, I’m kind of a confused person since I just started crocheting like 2 months ago XD. 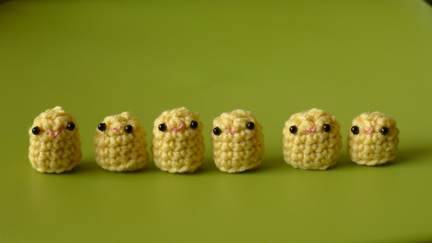 I know amigurumi is usually worked in rounds so it’s probably just regularly crocheted isn’t it? haha, I feel stupid, I don’t even know if I spelled amigurumi right XD. Yeah, I pretty much only understand amigurumi stuff so if this isn’t I’ll probably just try to create my own pattern or something. Thanks! I love your pattern for your tater tots — thank you for sharing it. I’ve tried numerous times but it never comes out looking like yours. 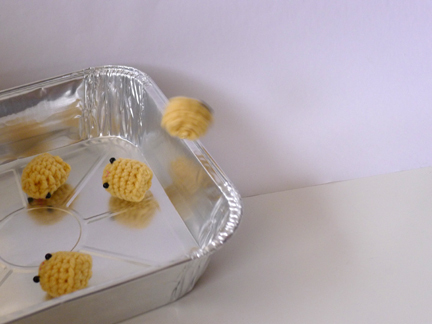 By any chance, do you have a tutorial for the tater tots like you do for some of your other patterns. Visual aid works better for me. Thank you very much. thank you for visiting, Donna! 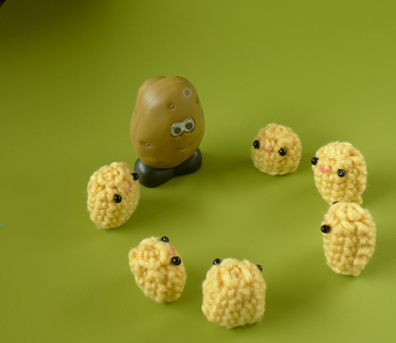 tater tots is one of my earlier pattern before i made it a habit to add in‐process photos to make the pattern easier to understand. unfortunately i don’t have any in‐process photos for the tots, but i will try my best to have lots of photos for future patterns! if you can let me know which part of the pattern you’re having trouble with i’ll try my best to help! what i always do as well is shape the finished plush in my hand, just squishing it this way and that until it looks the way i want it to. hope that helps! 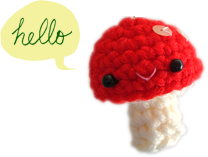 i made this small so it can be a cell phone charm! awesome pattern! I love the idea! Although I’m stuck on row one, as I’m new to crocheting. Could you possibly reword it?? thank you for visiting! you’re not alone regarding row 1! i’ve added process photos and more explanation about that because of a few questions i received. 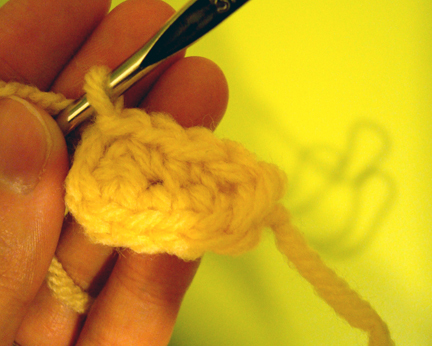 row 1 is like crocheting in a circle, you turn the work clockwise as you crochet, except it’s crocheting along a chain. you crochet into each stitch of the chain, and at the end of the chain, you turn the work 180 degrees clockwise (the first process photo shows the work after it’s been turned), so you start to crochet into the free loops of the chain you had previously crocheted into. hope that helps!